Having the friends over for dinner, drinks and laughter certainly conjures up fun times. Catching up on current events, hearing tales of gossip, and sharing food and drink is just what we need after a hard week’s work. However, we all know that, upon arrival, the guests don’t immediately flock to the dining table. First things first: drinks are poured, snacks are provided, and everybody is shown to a comfortable seat to relax before the meal is presented. It is situations like these where a terrace is the crème de la crème of socialising spots: being able to enjoy the cool night air with a stylish backdrop of a garden or city lights. And if the terrace (or balcony, or porch) happens to have a grill right there, all the better! So, to get your creative cogs turning, let’s take a look at seven sensational terrace designs to inspire you for yours—and, for fun, let’s throw in some food and drink suggestions to go with our stylish spaces. 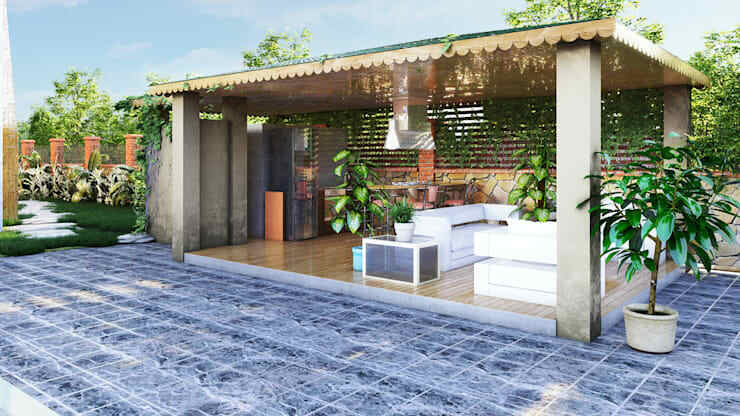 No need to feel cramped – Huga Architects is spoiling us with this spaciously stunning terrace that will ensure everybody feels ultra comfy (on deliciously dark rattan furniture, no less). But we all know the importance of a good view, which is why the garden does an immaculate job of providing charming scenery with colours that pop. 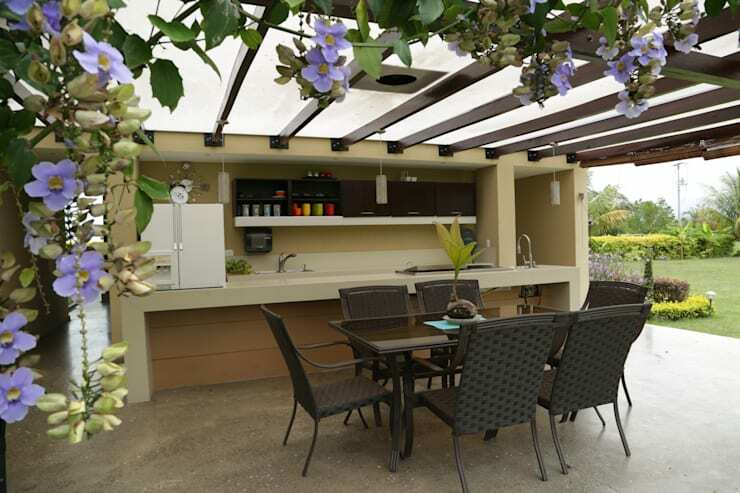 And since an exterior dining set has been placed right there, we can certainly enjoy an al fresco dinner party under the stars. 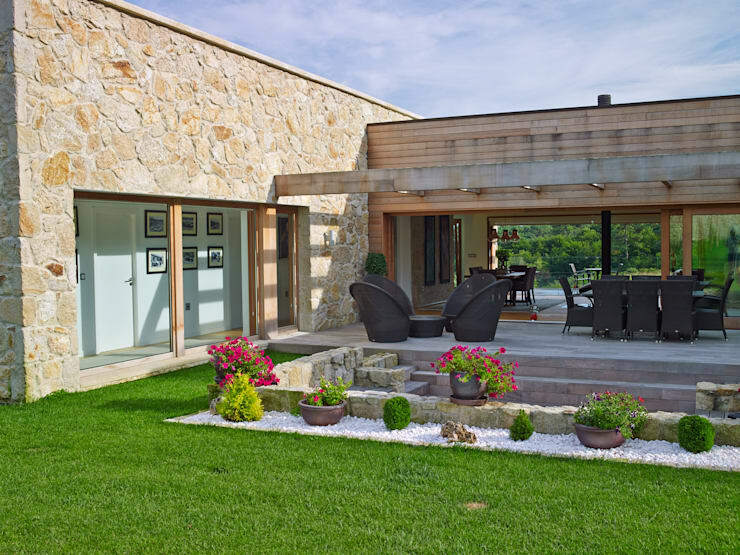 Notice how splendidly those stone surfaces contrast with the lush lawn, providing a visual balance between neutral and naturals. How about a delicious mix of pizzas and beer? A terrace is not just an exterior space – it is an extension of your house. Therefore, one cannot allow a perfectly decorated house to be joined with a bland and boring terrace. Luckily, our example above by TG Studio has no worries about being deemed dull. It really is difficult to decide what, exactly, is the prize-winning element here. Is it that stone wall? The fantastically alluring couch? Perhaps it’s that wildlife view in the backdrop. Or maybe it’s the realisation that this space is 100% possible and could truly be yours, where you become the star host/hostess who proudly shows the guests to the terrace outside to enjoy some pre-drinks and laughter. The perfect spot to enjoy some wine and cheese pairing! A tropical holiday in your very own yard? Who says it’s impossible? GRNT3D certainly doesn’t, as they take all the credit for this dreamy oasis. To take full advantage of socialising and entertainment, a grill area was implemented, only a few feet from the seating area. A delightful mixture of modern and classy adorns every square inch, with a tropical vibe firmly established to ensure a fun time. And who could overlook that fantastic tile work surrounding this holiday hot-spot? 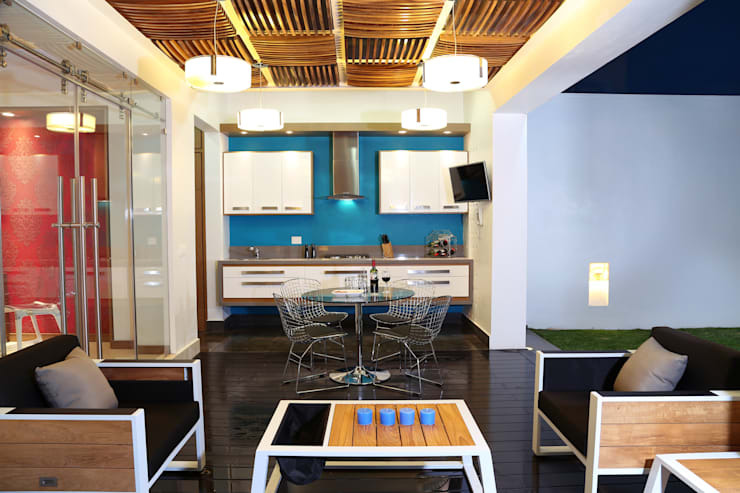 With its superb combination of dark and light blues, it forms an oceanic landscape to our little tropical resort. And the grub to accompany this fabulous space? We’re leaning towards a seafood dish and a light Pinot Noir. 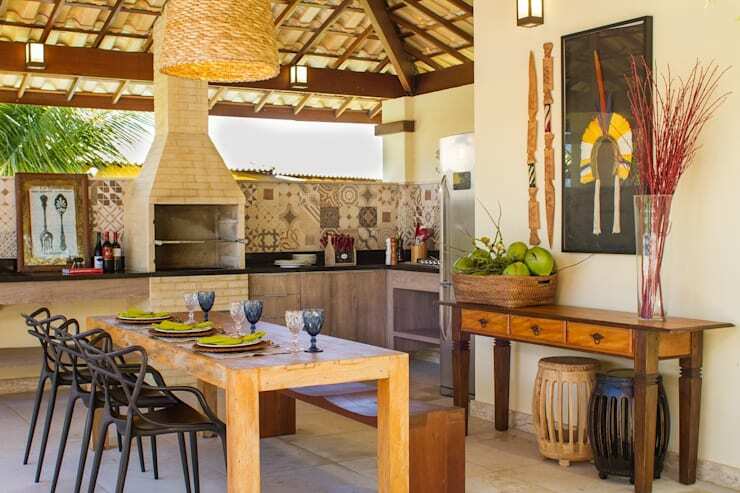 Taking its cue from the Mediterraneans, this rustic-style space certainly doesn’t hold back when it becomes time to dish up stylish areas. Jamile Lima Architects decided to add a pitched roof, adding even more visual space to this already roomy terrace. The barbeque hot-spot is joined by an exterior fridge, removing the need to retreat indoors every time somebody needs a refill. And dinner time? It is sorted, with a stunning table and chair set providing adequate space to enjoy a five-star meal. We just love how the neutral palette comes to life with the inclusion of those green, red and blue colour spots! As for our palates, we request that a delicious stout beer be served with our smoked barbeque. Arketipo-Taller decided that, to achieve a terrace space that is not only stylish and comfortable but also memorable, we need a variety of materials and colours to zhoosh up the place – and they weren’t wrong! Designer furniture adds a unique presence to this outdoor space, that is seemingly dominated by strong and classic lines. Dark and light surfaces contrast fantastically against each other, yet it is our opinion that the electron blue wall becomes the focal point here. And what an ingenious idea to have the dining furniture in wire, making them seem almost transparent to add more visual space. Let’s enjoy our dessert right here: double-chocolate cake with a black-fruit port, anyone? There is no denying the appeal that raw materials can bring to a space. Terence Architects certainly feel the same way, which is why they opted for this combination of wood, concrete, tile and timber – but it is most certainly that red brick texture that takes centre stage here. Warm earth colours and strong patterns make for a tantalising backdrop where we can spend our leisure time, whether it’s a noisy Friday night with the friends or a calm Saturday afternoon with the family. A mixture of different vibes surface here, making it a very bohemian space – yet, we feel like suggesting margaritas and spicy nachos for a marvellous Mexican evening. A terrace is the ideal spot to enjoy a sit-down with friends. 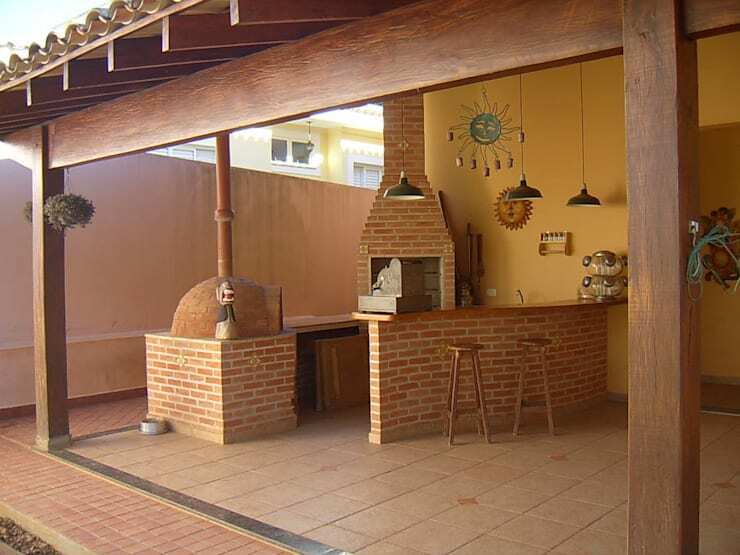 But add a fridge, sink, worktop and shelf and what do we have – our very own outdoor kitchen! Colectivo Creativo combines comfort with elegance, and who dares to say “no” to this excellent area? A frosted glass pergola is our protection from a drizzle, yet the terrace is still skilfully left open and spacious to ensure that nobody feels claustrophobic. And the final touch of ranking flowers, which projects a vision of a delicate vineyard with its lush grapes, has us leaning towards a dinner of beef stew paired with a stunning Merlot. Let’s see: How to build a pergola: a step-by-step guide. Which terrace design is your favourite? How would you design your terrace? Let us know!